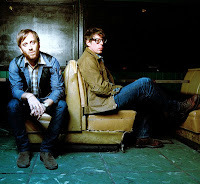 They may be one of America's biggest bands, but here in the UK The Black Keys are only beginning to break into wider conscience. It was a surprise then when the Ohio duo announced a full arena tour over on these shores; a refreshingly inclusive play yet one which risked the indignity of gaps among the assembled masses. At roughly three-quarters capacity, turnout at Newcastle's Metroradio Arena was perhaps healthier than one may have expected, and those who did show their faces were treated to a show which displayed just why they've reached such a lofty status. Before all of that, though, there was the small matter of an opening slot from South London's Maccabees, whose latest album Given To The Wild has been among the most hyped of the past years in certain sections of the British press (*cough* NME *cough*). I can't claim to be their biggest fan, but they came close to winning me over with a thoroughly competent performance which added both energy and muscle to their comparatively limp studio recordings. The new record's empty soundscapes leave me especially indifferent, but although that issue wasn't completely remedied it was patently obvious songs like "Feel To Follow" and "Forever I've Known" were written with venues such as this in mind. The Black Keys have of course become well versed in the art of headlining arenas, and proved as much in an hour and 20 which bore all the fruits of their stateside exploits. Backed by a bassist and second guitarist, Dan Auerbach and Patrick Carney initially made their name through sheer consistency, having produced a string of impressive records throughout the '00s. Recent outings Brothers and El Camino have, however, seen their fanbase expand tenfold, so it was no shock that pair made up the majority of tonight's setlist. All the hits ("Tighten Up," "Lonely Boy," "Gold On The Ceiling") were aired and rapturously received alongside a multitude of similarly excellent album tracks ("Next Girl," "Ten Cent Pistol," "Sister"); each drilled to perfection and polished off with full band sheen. Tonight's best moments, though, tended to come when when they delved into the older reaches of their catalogue - a pleasingly regular occurrence given the extent to which records such as Rubber Factory and Attack And Release have become overshadowed. In a blatant nod to long-term fans, most of these numbers saw Auerbach and Carney ditch the supporting caste and revert to a duo, ripping through the likes of "Thickfreakness" and "Girl Is On My Mind" with the same energy and vitality they possessed when setting out a decade ago. Closing gambit "I Got Mine" was arguably the highlight of the entire night; its colossal riffs reverberating with a rawness this arena's rafters won't have experienced in a long, long time. The odd empty block did tell a story regarding the group's current popularity, but the fact they still managed to shift eight to nine thousand tickets in the run up to Christmas proved such an extensive trek was indeed justified. That of course is before you even begin to consider the performance itself, which was conducted with the verve and swagger of a group fully acclimatised in such surroundings and well equipped to go even further. It may be a few years down the line, but should The Black Keys ever return to Newcastle you suspect those unsold seats will be snapped up.